Acupuncture Indianapolis, IN | What is Acupuncture? Many people who struggle with ongoing chiropractic pain or injuries find that alternative treatment methods are more effective than surgical treatments. Since there are a variety of causes for back pain, there is no one-size-fits-all treatment. Due to this, the treatment that works for one person may not work for another. Therefore, it is much more efficient to customize the treatment to the needs of the individual. People who choose surgery as the first treatment option for any form of chiropractic pain may be getting ahead of themselves. While surgery is necessary in certain cases, it should be a last resort for treatment. We can help develop a treatment plan using natural non-surgical techniques. We also may use acupuncture as a non-surgical treatment that can help to remedy a variety of health issues. Acupuncture is a medical practice of traditional Chinese medicine that involves inserting small needles into specific points on the body. While the needles will break the skin, they are usually the size of a hair or small in comparison to needles that one uses to administer shots. While the effectiveness of acupuncture can vary per the condition of the patient, there are multiple benefits of acupuncture. Acupuncture can help to balance out the flow of energy in one’s body by helping to open up pathways known as meridians. The points that a professional places the needles will stimulate the nerves, muscles and tissue. It is important to note that acupuncture is not a cure. This treatment can help to alleviate symptoms and pain from other conditions. In many cases, acupuncture is effective when accompanying another treatment. To properly use acupuncture as a treatment, the medical professional needs to identify the specific points on which to place the needles. We have the skills and knowledge to know this placement and to provide the proper treatment for the patient’s needs. While each treatment process can be different, the general acupuncture session can take up to an hour. Once we determine that acupuncture is the necessary treatment, we will schedule the appointment. The patient will lie on a table while a professional places the needles at specific points of the patient’s body. These needles will help to open up the pathways in the body, stimulate the nerves and help promote pain relief in most cases. By customizing the treatment plan for each patient, we can help you receive the care you need. We will determine how many appointments are necessary for the initial consultation and can continue the process for how long the patient needs. Here are some common questions people ask about acupuncture and our answers. 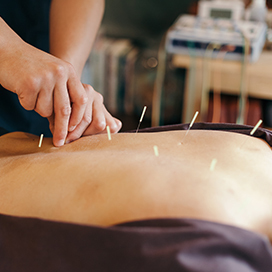 While movies and other forms of media spread the idea that acupuncture needles are painful, the truth is that most people do not feel them at all. If there is any amount of feeling, it is the smallest feeling of a prick on the surface and a bit of aching once the needles reach a certain depth. In most cases, no. While some patients feel a bit of soreness occasionally, most patients will feel relaxed or energized afterward. Since it varies per patient, we will be unable to know for sure until after the first treatment. What Happens if Acupuncture Does Not Work for Me? If your body does not react well to acupuncture or the treatment does not seem to help, we will recommend a different treatment from a variety of possible options that we offer. How Long Will it Take for The Results to Take Effect? The results can vary per patient due to the type of condition they are struggling with. Some patients will feel relief right away, while others may need more time. Since we can customize the treatment to your needs, we can alter the treatment plan as necessary. While there can be some risks depending on the patient’s condition, they are minimal. It is important to go over your current condition and medical history with us before the treatment so we can prevent as many potential risks as possible. Is There Only one Type of Acupuncture? No. There are not only different types of acupuncture treatment, but there are also different techniques that a professional will develop through the proper training. This is why it is important to find a professional acupuncture service with the proper qualifications. If you think acupuncture treatment is right for you or a loved one, then call us today. We will help you receive the treatment you need on the path toward healing.